They say a picture’s worth 1000 words and since these daily posts are fewer than 100 let’s use a couple of pictures to help us understand the difference between our music library played through a computer connected via USB vs. the same connected over a home network. 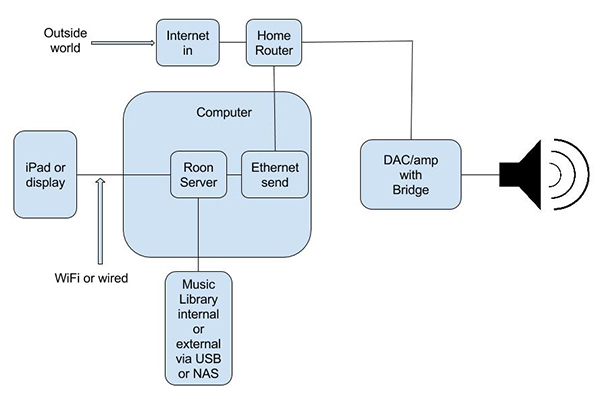 We’ll use the Roon server in these diagrams, but the first diagram could use any number of servers, including JRiver, iTunes, Etc . Here’s what a typical computer setup connected to our DAC through USB might look like. Note a few things here. The big shape labeled “computer” is the hub where the server is and, connected to the computer, everything else. If we’re using an iPad or Android tablet we’re connected via WiFi through the router, etc. What’s important to note is the USB fixed cable to the DAC. USB cables are electrically connected to the power and data lines of the computer – a problem for jitter, ground loops, noise from the computer into the DAC. It is this very connection that products like the USB Regen, Disruptor, Jitterbug exist to clean up. Here is the same setup only this time, instead of going through USB, we output through Ethernet. This kind of output isn’t common for servers and only a few can do it. Roon, JRiver, Minimserver, Twonky, NAS are examples of servers that can prepare their data to be sent over Ethernet. Note the differences between the two. Ethernet connects very differently than does USB. It is this fundamental difference in the way music is transferred between one machine and the other that makes for the differences we’ve been talking about these last few days. 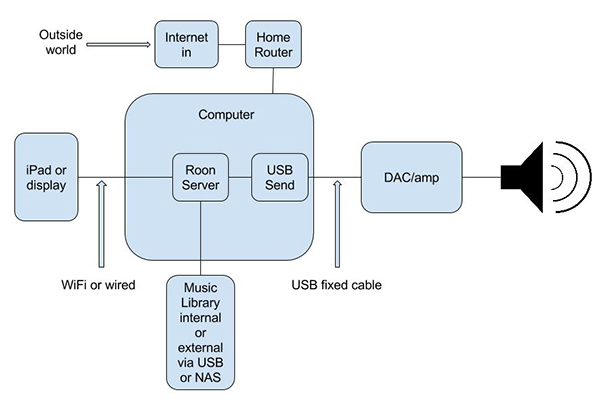 Interesting, but for me Roon in the diagram unneccessarily complicates things a bit ,if you simply just have music on a NAS does is still stand that it is better to for the DAC to receive the songs over the network share rather that directly via USB ? And if the advantage of Network versus usb is due to less physical components being involved, do you prefer Ethernet Cable or Wifi ? Music stored on a NAS has a server, like Twonky, and you’re stuck with its interface. If that’s ok and you’re willing to forego Roon as the interface, then a NAS is a better sounding option than Roon connected via USB. Just to complicate the matter, you can use a NAS to store your music and connect the NAS over the network to your computer, then connect via USB to the DAC. In that case, there’s no difference in sound quality – USB is still worse. You’ve accomplished nothing from a sonic standpoint. Only separating the player from USB helps. Using Ethernet I don’t think there’s much difference in SQ between WiFi and Cat 5. If you use USB you’re not on the network. I meant that you could have a NAS and no server (Roon or Twonky) as the files are visible on the network as a network path. Sure the UI would not be at all great but I thought the post was just about sound quality and a way of just demonstrating that listening to these files over network connected NAS drive rather than USB drive is better. Regarding Roon/Twonky does Roon use Upnp like Twonky or something else ? I wonder that a router with it’s powerful WiFi sender should not influence the signal quality on the LAN-cord. Or do you use a dedicated audio-router having WiFi disabled? The main router still has WiFi-connection to the music-server allowing the iPad remote control function. I am not a great poster, but I thought I will share my ongoing personal experience practically gained during the past 3 years, comparing USB vs. “Ethernet”/Network” (Bridge II) . To begin with, my personal basic preference is – “SQ factor” is (slightly) more important than “convenience factor”. – My preference is strongly pointing towards the “Ethernet/Network” choice. – To play stable high quality music, Wi-Fi is less preferred and mostly not capable of streaming “HD Music files”. – Yes, the quality of the router matters. – Yes, the quality of the power supply to the router matters. – Yes, the quality of the Ethernet cable between the router and the Bridge – matters. – Wi Fi to control the music server/player – the convenience to “Control” the music is maintained by using IPAD or Android device with the proper control software, over the Wi Fi capability of the router. Anxiously waiting for the new firmware Paul mentioned a few days ago, which will enable ROON to work with DS/BRIDGE II and replace my good old eLyric. To Paul, TED and PS Audio crew, I highly appreciate your continuous efforts and resources to raise, each time it happens, the bar of our PS Audio gear, by gaining quality, functionality and adding real new values. I use WiFi only for the iPad – everything else is hard wired – though I don’t find any difference between WiFi connected and hard wire connected except for occasional blips in service with the former. Paul based on your diagrams I believe I’m in the Ethernet camp. Here’s what I have: Internet in ( ATT U verse) to the router (Ethernet) then out from the PC HP TouchSmart ( USB to a AQ jitterbug) then to a Audioengine D2 wireless sender/receiver. The receiver is then connected by toslink to my Micromega MyDac via a Monarchy Audio DIP. What say you sir? Hmmm, yet an even different twist. I’ll bet this setup is better than a direct USB connection, though perhaps not as good as packetized data over ethernet – but honestly, I don’t know. Paul I forgot to add that I use tunein as well as Tidal and Spotify as my music sources. I have to say, this is nuts. Just a couple months ago in this comments section I promoted using a NAS and a Sonore SSR renderer over a network instead of a PC or Mac based USB server and you crushed me, saying (paraphrasing) “…..I’ve heard them, renderers sound okay, but not as good as my Mac….” You can’t come down that hard then just flip sides. I’m annoyed you condemned them just a few short months ago, and now they’re the best thing since sliced bread. And please, Roon won’t make my server sound better, just look better. Well, sorry, I don’t mean to “crush” anyone and I apologize if that’s what I did. But we’re talking apples and oranges. The Sonore is a computer and the fact that it connects to a NAS over the network isn’t the same. Perhaps that’s what we’ll make tomorrow’s post about so I can clarify that. In several previous posts you wrote that playing music directly from a FLAC file dosen’t sound the same as playing it from a WAV. In an Ethernet configuration as the second one you posted, if the FLAC decompress is done at the server side I understand this is not true anymore and both formats should sound the same as the DAC is completely unaffected by any noise, dither, et all that the format conversion might add. Paul, I personally think this all makes sense thank you again for your time in detailing all this and I have had success in my opinion setting up these systems in my home. I smile a bit when looking this over as I seem to be in all camps, at all times, as I have four distinct zones operating in my home, all pulling music from the NAS connected to the network. I run JRiver (although am tempted to try the RoonServer option except none of my iPads is new enough to run Roon) and like the interface presented by the JRemote app on my iDevices, or iPeng as well. In all, I have it (a) it serving up music from my NAS via Ethernet to my Yamaha Aventage receiver, which handles the DAC end and delivers music to the family room setup and (b) via wireless from the router to the upstairs system where there is a Squeezebox Duet unit installed which delivers a digital stream to an Audioengine DAC, which then delivers the analog signal to a connected vintage receiver (by the way, the same workstation running JRiver server also runs the Squeezebox server, seemingly with no ill effect) and (c) same setup with DAC/Squeezebox to another vintage system in the basement except that Squeezebox is hard wired, not wireless) and then (d) finally, the nearfield setup at the computer itself, with an OPTICAL connection out from the computer to a NAD D3020 integrated, which then powers the desktop speakers. I point out all this to indicate that all of this runs flawlessly. I can be pulling music from the NAS to multiple sources at the same time with minimal hiccups (but then only with the wireless connection). It was not daunting at all to set up and I would tell people to give it a shot, it just was not that hard to do and it seamlessly integrates all the same music that I own throughout the home to whomever wants to serve it up in their various locations. The same server software can also deliver the music to someone’s personal iDevice at the same time, rather than the stereos, for headphone listening as well. In my case, with all the DACs, there is no USB involved anymore. I swapped out the USB for optical when I introduced the NAD as I wanted the auto-on feature from standby, which NAD does not seem to support for USB (they tell me it’s not possible but I beg to differ on that as my previous Audioengine N22 amp would wake up from standby when needed and was on USB). I have heard pros and cons to delivery of music via optical vs. USB but I have not been able to tell any discernable difference with any of my musical selections. Also, as it relates to “Copper” I am hoping at some point in the “In My Room” section that we start to see more profiles of the “everyman” type system, which is more what I consider my setup to be. I have enjoyed the first two profiled systems but still think that they are far far above what I could ever afford to, or would every desire to own. I know on this site I may be in the minority, but, am offering this commentary. I noticed there are some requests in the Roon community for a NAS based Roon server. As you’ve written about in the past, NAS devices are evolving so quickly. For example, I run PLEX Media Server on my NAS thereby eliminating the need for a conventional computer. That would be great though I don’t know if it will be a Roon server on the NAS? Maybe – and if so, that would get rid of the need for a computer – though you’d still need an end point. I guess I’m confused then. If the NAS was running Roon server and, for this example, housing all the music files, wouldn’t PSA bridge enabled products complete the system? If it were running Roon Server then yes, the end point on the Bridge completes the package and it would be a sweet package indeed – though as I have said before, Roon’s pricey. I’m really trying hard to grasp the concept of Roon being “pricey.” It’s not just to pick on you, Paul, or anyone else for that matter. For example: if one prices out a great digital-only audio system composed of, say, PS Audio components and cables (DirectStream DAC with Bridge II, BHK Monos,and Vandersteen 5A speakers). Quick calculation later I come to around $50,000. Now figure in a music collection with NAS around $5,000. We’re now around $55k. Roon is $500 for a lifetime. How is that “pricey” in comparison. I would maintain that even if you have a modest system of around $5000.00 total that Roon is a great deal. The way it enhances one’s user experience is like no other. How do you put a price on that? Obviously a company must so I mean this as more than a rhetorical question. If you, Paul, or “bitperfectRichard” or any programmers reading this made such a program what would you charge for it? Consider how much went into creating it! I think Roon is a steal, personally. I think the thing is “in comparison” to other software and other software pricing models. I don’t exactly get comparing it to hardware. Though I know the “old days” of software pricing are largely gone. I just had to remind myself to cancel my $30/mo. Adobe CC subscription, as I am not using it at the moment. It’s a great product. It’s in a new-ish grey area between $3 iOS apps and stuff like Adobe programs. I was surprised when Paul remarked several times about Roon’s cost for the reasons Darmok and badbeef mention but maybe Paul is thinking about mass adoption? The lifetime cost of $500 is a gamble but can pay off for sure. However, we’ve seen other products like Amarra come way down in price so Roon’s dynamics will be interesting to watch. Keeping it all in context, paying $500 for the user experience that Roon offers is a reasonable sum. You get a lot for your money. Think of it another way: let’s say you don’t have a huge music library for whatever reason. If one buys Roon and signs up for Tidal, you immediately have a huge, wonderfully immersive music listening experience from day 1. Think how much you’d have to spend to collect and curate all that music! But Roon doesnt include Tidal for free, adding Tidal will cost a whole lot more. And remember, you don’t need Roon to have Tidal. Currently if you have a Bridge II installed, you can use Bubble UPnP on an Android controller to stream Tidal. And soon enough, MConnect for Apple devices will include Tidal. Roon does add a beautiful interface to Tidal and that’s the charm of it too. Well, I appreciate you feel it’s a bargain and yes, I agree, they’ve put an inordinate amount of work into it – so has Richard and Tim on Bit Perfect – but that’s not the point for me. So, what is the point? I think it limits them and with a program this good, I hate to see its use limited. They know my feelings well. Enno and I have had many a fine discussion over this point. And, it’s not like $500 is a lot of money in the grand scheme of things. Most of the accessories we buy and sell are at least as much if not more. If it were hardware, as you point out, this would be a bargain. The real problem they have is survival. Others, including us, are also working on building robust user experiences because we all understand the importance of it. What happens to them if others catch up and charge less? Even free? I suppose that’s the nature of the free marketplace. I like these guys, I like their product, I think they are an asset to our community. I just want to do what I can to help them stay around. Exactly. They have a big jump on everyone else, but that won’t necessarily last. Price it for wider adoption so you become the 800 lb. gorilla. But maybe they want to try and cover costs sooner to limit the risk of something surpassing them. Much of my resistance to Roon has been based on having a Squeezebox ecosystem for over 10 years (which Roon has not worked with so far – but I think it’s in Beta). I have had this Roon-ish sort of functionality all over my house (and deck), controlled by iPeng on my phone or iPad (including iPad 1). Both the Slim Server and iPeng used to be free. Slim Server (now Logitech Media Center) is still open source, and Coolio finally got around to charging for iPeng. But Roon would not control all of that. So the notion that I had to shell out $500 to control ONE system to fund their ‘gamble’ that they win the Server Wars just didn’t sit well with me. I have similar feelings about Adobe. Now that they moved to a subscription model, I feel disinclined to use their products. I’m sure it’s great for them, and maybe it’s the smart business move. But I resented, as a long-time customer, having pricing options taken away, and they’re not the only software option. Having said all that, I’m probably going to do a year of Roon, as it has improved a lot, and makes sense in the context of the DSJ. Ok, I get what everyone is saying even though I don’t agree. I also understand that from everyone’s posts that somehow software is not seen as valuable as software. So what’s your suggestions to rectifying the pricing structure? I’ll give one: perhaps just bundle it with a PS Audio Bridge II purchase so it seems “free” to the end user. Anyone else? What did you suggest to Roon, Paul? I think software is just as valuable as hardware (which is what I think you meant). But it’s a much harder sell because one is just bits, the other is something you can hold in your hand and has a parts cost easily justified. We all understand at a basic level the hundreds of hours and the great amount of struggle it takes to write code – and you should have a right to charge for it. But the sad fact of life is it has lesser intrinsic value because there’s nothing physical to it. It’s a constant problem for manufacturers. We put in at least as many man hours to build some hardware products but then can only charge based on the parts cost + an adder for labor. It’s just the way the world works. Few have managed differently. I suggested to them that they could rule to world if they changed their pricing model to allow manufacturers to bundle the software and support them. None of us wants to write that amount of code to support our products. And while they can come down a little to do that, they cannot reduce it enough to matter. The best they’ve done is made it possible for a year’s worth, or something like that. No manufacturer in their right mind can accept that. If we were to base an entire product around this software and then force people to have to spend another $500 to keep it going after the trial period ended – or if they went out of business eventually and couldn’t support it – then our customers would be left holding expensive, yet, suddenly worthless bricks. And that’s the basic disconnect. Roon depends heavily on metadata they have to pay to maintain and if they tank, that data will no longer be available and the program becomes worthless, along with whatever piece of hardware depends on it for its operation. Thanks for the thorough and enlightening reply from your side of fence. Yes, I did mean to say “software is just as valuable as hardware” thanks for catching that. I was in a hurry (like now), but always have so much I want to write in reply. Software IS valuable, but from my perspective as a video and audio producer, a while back I was able to buy Adobe CS6 at a discount for around $850. If you have any experience of the scope and depth of even ONE of the programs in that suite, it’s pretty hard to compare even the best music server/metadata software to it, value-wise. I’m not saying it’s fair, it’s just what I’ve been used to. Now you have to pay $30/month for Adobe CC. Roon is $10 a month. Still seems like a lot in comparison. AND I hate that Adobe has imposed the subscription model on things. That’s mostly what it’s about. Don’t get me wrong. I think it’s the best out there by a long shot.